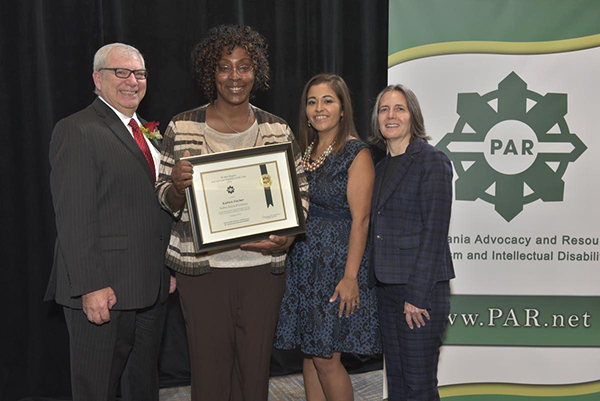 Katrice Fischer has had many accomplishments lately, including receiving the award for Self-Advocate of the Year at the annual PAR (Pennsylvania Advocacy and Resources for Autism & Intellectual Disabilities) conference in Harrisburg. The other achievement that is so important to Katrice is landing her “dream job” at Erie Insurance Arena. She has been working on the cleaning team for more than three years, and said that finding this job has been the key to happiness. Katrice had previously worked in two other jobs, but said neither felt as though they were a really good fit for her. She contacted the Supported Employment Program at the Barber National Institute again to help in her search for a new position.